The new Shelby GT350 Mustang hasn’t arrived in order banks just yet, but a post on Mustang6g insists that the new super-Stang will arrive late in the run of the 2015 model year – possibly as a limited edition model leading into greater production for 2016. There have been a variety of aspects of the new Ford Shelby GT350 Mustang left a mystery by the automaker since the 2014 Los Angeles Auto Show debut last year and one of those mysteries is the model year of the new GT350. 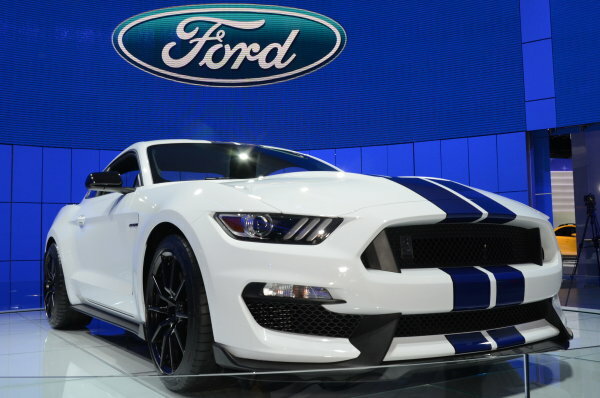 At first, it was believed that it would be a 2016 model year, following up the 2015 debut model year, but if that was the case, then why didn’t Ford just call it the 2016 GT350? Well, a comment made by a Ford executive about there being a special reason for the delay in announcing the model year got us all thinking. The consideration was that perhaps Ford is going to try to squeeze in the Shelby GT350 Mustang for the 2015 model year, but with the end of the 2015 model year coming to an end this summer, it wouldn’t leave the Motor Company much time to sell the new high performance pony. Regardless of the time constraints, information from Mustang6g.com indicates that there will be some new GT350 Mustangs included in the 2015 model year. Mustang6g.com member Five Oh Brian is a wealth of new model information and this time, he has told his fellow forum members that there is a 2015 Shelby listed in the internal information on the 2015 Mustang production process. The 2015 Shelby is listed as a Job 3 build, meaning that it would be built late in the model year run, before 2016 model year retooling. Provided that this is the case, we will likely see the new GT350 Mustang on the street much earlier than first expected. However, if the 2015 Ford Shelby GT350 Mustang isn’t slated to begin production until late in the 2015 model year production run, volume will almost certainly be heavily restricted. After all, the new Shelby GT350 will be built on the same assembly line as the rest of the Mustangs, in these higher performance models will need to be squeezed into the normal production of the popular 2015 Mustang GT, EcoBoost and V6. Because of that, I have to wonder if the 2015 Shelby GT350 Mustang might not be a far more limited production model than we initially expected. Perhaps Ford plans to build a couple hundred of the new GT350 for 2015 to properly celebrate the 50th anniversary of the first Shelby GT350 back in 1965. This low number of 2015 models could be used to satisfy some of the early demand from deep pocketed buyers who want a collectable – not a performance car to take to the track. After the 2015 models have answered some of the early collector demand, a 2016 model year Shelby GT350 with much higher production volumes will then have less of a markup for those folks looking to go racing with their new Mustang. Does anyone know if these will be sold in RHD and if so if any will be coming to Australia. Now that our own Falcon GT has been killed off we need a new performance V8 Ford.